"Bad Hombres"; "rapists"; "traffickers", and many other adjectives have been used both by the president and by his Administration in general, to qualify immigrants as sources of evil, in an effort to maintain their radical anti-immigration policies. In states like Texas - where Trump won with 52.2% of the vote and where racism and xenophobia are the bread and butter - the reality of immigrant citizens is radically different from what the government and the far right want to sell. According to a study published by the Cato Institute (a public policy research organization), during 2015 in Texas "the criminal conviction and arrest rates for immigrants were well below those of native-born Americans. Moreover, the conviction and arrest rates for illegal immigrants were lower than those for native-born Americans," which contradicts the positions of the Presidential Executive Order and Attorney General Jeff Sessions when they promoted the aggressive detention and arrest of immigrants, arguing that they were "important sources of crime." The study used data from the Texas Department of Public Safety (DPS) to compare the numbers of convictions and arrests of legal and undocumented immigrants for a variety of up to 46 different types of crimes in the state of Texas between January 1, 2011, and on November 15, 2017, and the numbers of convictions and arrests in the native population under the same ranks. Paradoxically, the Cato Institute had access to this information because the Texas security agencies cooperate with the federal authorities in the Department of Homeland Security crossing biometric information that allows a more objective look at the criminality according to the immigration status. 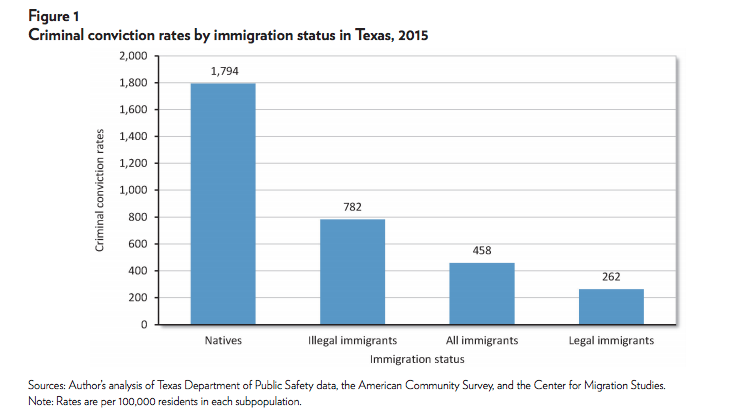 In 2015, there were 22,797,819 native citizens in Texas (83% of the population), 1,758,199 undocumented citizens (6.4%) and 2,913,096 (10.4%) resident immigrants with legal documentation. With these figures - and their respective evolution over the past two years - the investigators determined that the homicide conviction rate in the undocumented community is 25% below the rate of the native-born population, as is the rate of convictions (11.5%), and sexual crimes (79%). While undocumented immigrants are often arrested for crimes of gambling, kidnapping, robbery, and vagrancy, those crimes only summed 0.18% of all convictions in 2015 in Texas. More generally, in the total spectrum of convictions, undocumented immigrants were 56% below the rate of native citizens, and immigrant residents were 85% below. "That tells us that this is not a population that commits a lot of crime," analyst Alex Nowrasteh told the Dallas News. "If it is true in Texas, it has got to be true in much of the United States." These figures show that the government's allegations - especially in a border state with Mexico and with a Republican preponderance - are openly vitiated by prejudice and racism, and do not hold certain scientific figures when making the immigrant citizen (with or without documents) its scapegoat.